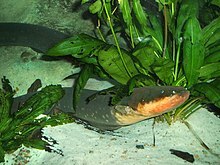 The electric eel uses electric shocks for both hunting and self-defense. Bioelectrogenesis is the generation of electricity by living organisms, a phenomenon that belongs to the science of electrophysiology. In biological cells, electrochemically active transmembrane ion channel and transporter proteins, such as the sodium-potassium pump, make electricity generation possible by maintaining a voltage imbalance from an electrical potential difference between the intracellular and extracellular space. The sodium-potassium pump simultaneously releases three Na ions away and influxes two K ions towards the intracellular space. This generates an electrical potential gradient from the uneven charge separation created. The process consumes metabolic energy in the form of ATP. The term usually refers to the electricity-generating ability in some aquatic creatures, such as the electric eel, electric catfish, two genera of stargazers, electric rays and to a lesser extent the black ghost knifefish. Fish exhibiting such bioelectrogenesis often also possess electroreceptive abilities (which are more widespread) as part of an integrated electric system. Electrogenesis may be utilized for electrolocation, self-defense, electrocommunication and sometimes the stunning of prey. The first examples of bioelectrogenic microbial life was identified in brewer's yeast (Saccharomyces cerevisi) by M. C. Potter in 1911, using an early iteration of a microbial fuel cell (MFC). It was founded that chemical action in the breakdown of carbon such as fermentation and carbon decomposition in yeast is linked to the production of electricity. Decomposition of organic or inorganic carbon by bacteria is paired with the release of electrons extracellularly towards electrodes, which generate electric currents. The microbe's released electrons are transferred by biocatalytic enzymes or redox-active compounds from the cell to the anode in the presence of a viable carbon source. This creates an electrical current as electrons move from anode to a physically separated cathode. There are several mechanisms for extracellular electron transport. Some bacteria use nanowires in biofilm to transfer electrons towards the anode. The nanowires are made of pili that act as a conduit for the electrons to pass towards the anode. Electron shuttles in the form of redox-active compounds like flavin, which is a cofactor, are also able to transport electrons. These cofactors are secreted by the microbe and reduced by redox participating enzymes such as Cytochrome C embedded on the microbe's cell surface. The reduced cofactors then transfer electrons to the anode and are oxidized. In some cases, electron transfer is mediated by the cellular membrane embedded redox participating enzyme itself. Cytochrome C on the microbe's cell surface directly interacts with the anode to transfer electrons. Electron hopping from one bacteria to another in biofilm towards an anode through their outer membrane cytochromes is also another electron transport mechanism. These bacteria that transfer electrons in the microbe's exterior environment are called exoelectrogens. Electrogenic bacteria are present in all ecosystems and environments. This includes environments under extreme conditions such as hydrothermal vents and highly acidic ecosystems, as well as common natural environments such as soil and lakes. These electrogenic microbes are observed through the identification of microbes that reside in electrochemically active biofilms formed on MFC electrodes such as Pseudomonas aeruginosa. ^ Schoffeniels, E.; Margineanu, D. (1990). "Cell Membranes and Bioelectrogenesis". Molecular Basis and Thermodynamics of Bioelectrogenesis. Topics in Molecular Organization and Engineering. 5. pp. 30–53. doi:10.1007/978-94-009-2143-6_2. ISBN 978-94-010-7464-3. ^ Bullock, T. H.; Hopkins, C. D.; Ropper, A. N.; Fay, R. R. (2005). From Electrogenesis to Electroreception: An Overview. Springer. ISBN 978-0-387-23192-1. ^ Castello, M. E.; A. Rodriguez-Cattaneo; P. A. Aguilera; L. Iribarne; A. C. Pereira & A. A. Caputi (2009). "Waveform generation in the weakly electric fish Gymnotus coropinae (Hoedeman): the electric organ and the electric organ discharge". Journal of Experimental Biology. 212 (9): 1351–1364. doi:10.1242/jeb.022566. PMID 19376956. ^ Raghavulu, SV, et al. "Relative Effect of Bioaugmentation with Electrochemically Active and Non-Active Bacteria on Bioelectrogenesis in Microbial Fuel Cell." Bioresource Technology, vol. 146, 2013, pp. 696-703. ^ Velvizhi, G., and S. Venkata Mohan. "Electrogenic Activity and Electron Losses Under Increasing Organic Load of Recalcitrant Pharmaceutical Wastewater." International Journal of Hydrogen Energy, vol. 37, no. 7, 2012, pp. 5969-5978. ^ Malvankar, Nikhil S.; Lovley, Derek R. (2012). "Microbial Nanowires: A New Paradigm for Biological Electron Transfer and Bioelectronics". ChemSusChem. 5 (6): 1039–1046. doi:10.1002/cssc.201100733. PMID 22614997. ^ Inoue, Kengo; Leang, Ching; Franks, Ashley E.; Woodard, Trevor L.; Nevin, Kelly P.; Lovley, Derek R. (2011). "Specific localization of the c-type cytochrome OmcZ at the anode surface in current-producing biofilms of Geobacter sulfurreducens". Environmental Microbiology Reports. 3 (2): 211–217. doi:10.1111/j.1758-2229.2010.00210.x. PMID 23761253. ^ Kumar, Ravinder; Singh, Lakhveer; Wahid, Zularisam A.; Din, Mohd Fadhil Md. (2015). "Exoelectrogens in microbial fuel cells toward bioelectricity generation: A review". International Journal of Energy Research. 39 (8): 1048–1067. doi:10.1002/er.3305. ^ Garcia-Munoz, J., et al. "Electricity Generation by Microorganisms in the Sediment-Water Interface of an Extreme Acidic Microcosm." International Microbiology, vol. 14, no. 2, 2011, pp. 73-81.